It looks like the perfect partnership, Grace had lost a number of relationships due to how close she is to her younger sister, Millie. None of the men could see past Millie’s Down’s syndrome, none could see the wonderful girl that Grace adores, not until Jack. After a whirlwind romance Grace thinks she has everything she’s ever wanted in a man. Jack treats her like a queen, loves her sister Millie and has an incredible job legally representing female victims of abuse. Their wedding day doesn’t go quite to plan, Millie falls and hurts herself but under pressure from Jack and their guests, Grace continues with the ceremony. It’s only when they get to their hotel room in Thailand does everything fall apart. Now that the ring is on her finger and his plan is in motion he doesn’t need to hide his plan from her any more. Instead of being the first day of her happily married life, Grace starts to live a nightmare she couldn’t have dreamt. Behind Closed Doors is B. A. Paris’ début novel and with it she crafts a gripping tale of abuse, lies and female friendship. Jack uses her love for Millie against her constantly and while keeping her imprisoned in the ‘perfect’ home he tortures her with plans if what he will do when she comes to live with them at eighteen years old. You follow Grace as she goes through the stages of disbelief, shock, fear and acceptance before it turns to anger and action. You feel desperately for Grace’s hopeless situation and you can feel her personality being crushed by the pressure of the situation. 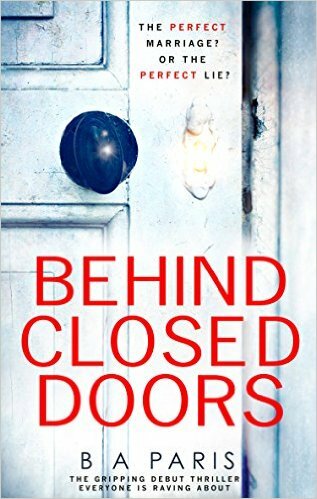 Dark, claustrophobic and tense Behind Closed Doors is sure to get B. A. Paris a lot of positive attention.